PhillyVoice reporter Bailey King stretches during a recent Fusion Flow yoga class at Yoga Brain in East Falls. The new studio offers classes for all levels of experience. 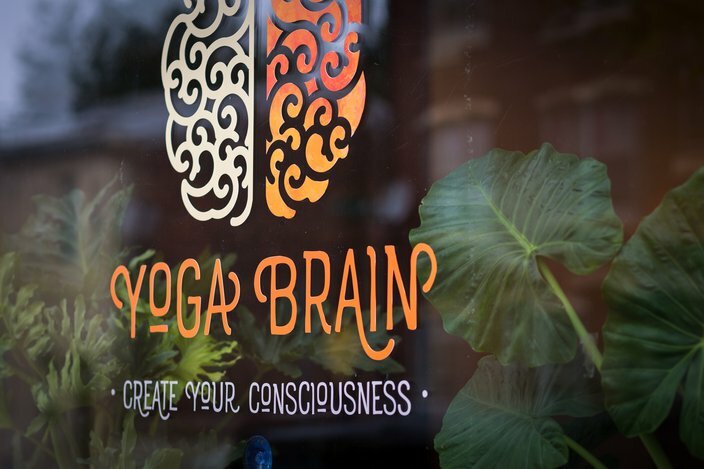 Nestled on Conrad Street in East Falls, one of the neighborhood’s main streets, is the new Yoga Brain studio. 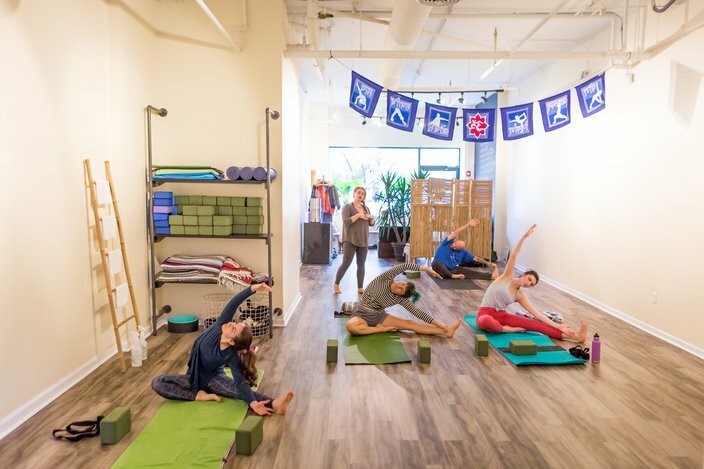 Owned and operated by Justine Bacon, a local yogi whose experience ranges from co-founding Philly Yoga Factory to teaching stand-up paddle board yoga at Aqua Vida, it's been open just a few weeks. We decided to check out Yoga Brain earlier this week for its Fusion Flow class — a 75-minute blend of Hatha, Vinyasa and even Bikram practices (with influences from other practices as well) — led by Bacon herself. Here's what we found. 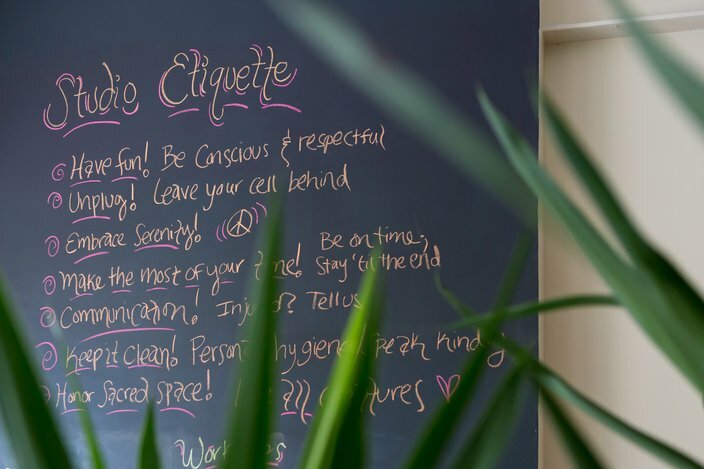 A chalkboard reminds yogis of studio etiquette at Yoga Brain in East Falls. Upon entering Yoga Brain’s bright and clean space, you’re welcomed into the front-desk reception area with its tons of plants, ample wellness-centric reading material, a Berkey water filter and yoga mats for rental — all separated from the studio by a trendy room divider. To your left, a wall covered in chalkboard paint outlines important information like upcoming events, news and studio etiquette. For example, one fun event Yoga Brain has on the books is a Witchy Workshop, which will go over the ancient practices of Halloween including some light yoga and herbal concoctions. Justine Bacon, owner of Yoga Brain, leads a recent 9 a.m. Fusion Flow class. The studio opened a couple of weeks ago. 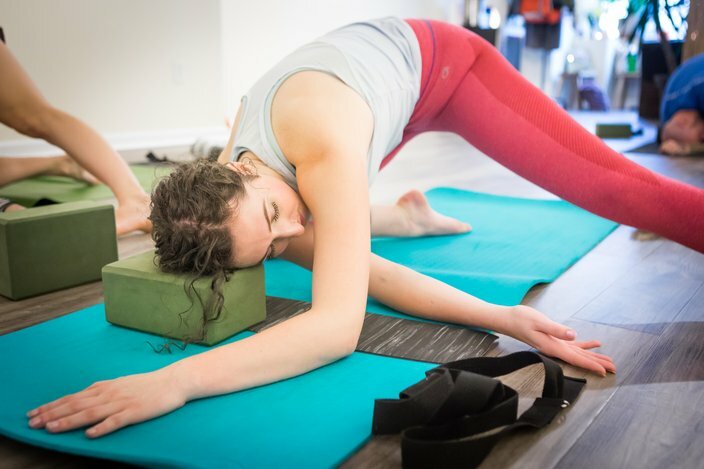 PhillyVoice reporter Bailey King is pictured in the reclined bound angle pose during a morning Fusion Flow class. 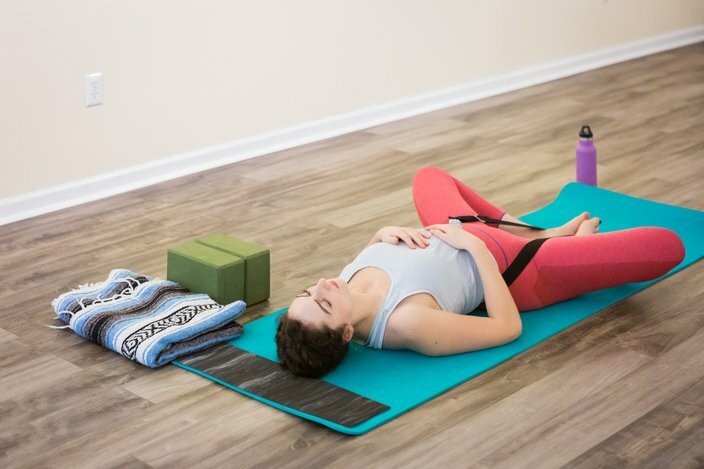 Class began, above, in a yoga strap-supported Supta Baddha Konasana (reclined bound angle pose), a lovely hip-opener to make you feel perfectly cocooned and stretched at the same time. The studio provides all sorts of props that you may need during class, from straps to blocks and even cut-up slices of yoga mats to provide extra padding for your knees, if needed. The Fusion Flow class incorporates traditional, modern and power yoga practices. 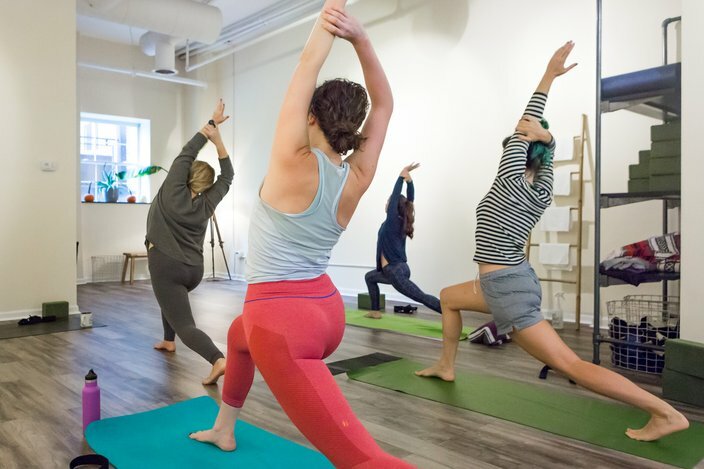 The studio also offers a popular Women’s Yoga class. Fusion Flow is a class recommended for yogis with at least one year of regular practice, so you could call it an intermediate class as it definitely introduced some challenging postures. My balance and flexibility was most certainly put to the test in this fairly fast-paced class, and I was quite sore the next day. But Bacon was always there to lend an assist to help you get deeper into a posture or to correct your form when necessary. During a class at Yoga Brain, owner Justine Bacon makes a hands-on adjustment for a student in a downward dog pose. While this class is geared toward yogis with some experience, there are a number of classes on the schedule for all levels. Yoga Brain’s Women’s Yoga class is one of its most popular, welcoming all levels as well as pre- and post-natal women, featuring poses that celebrate the moon’s feminine energy. The 75-minute class also serves as a safe place for women to discuss what’s going on in their lives and other female-centric topics. Justine Bacon instructs students in a version of a side body stretch during a 75-minute class on Monday. Another noteworthy class at Yoga Brain is Bacon’s signature Yoga for Runners and Cyclists class, which she’s been teaching for years. This very specific yoga class came about essentially out of Bacon’s curiosity. She began adjusting (and even combining!) postures for athletes with specific injuries, tightness and weaknesses and — voila! — the class was created. You can check out all of Yoga Brain’s classes and descriptions here. Yoga Brain is located at 3426 Conrad Sts. in the East Falls neighborhood of Philadelphia. While Yoga Brain is open and running at 100 percent, some new things are headed to the studio. Bacon plans to eventually install an infrared heating system for hot yoga classes and, later this week, there will be a donation-based hot tea exchange. All in all, Yoga Brain shaped up to be a pretty awesome new studio. 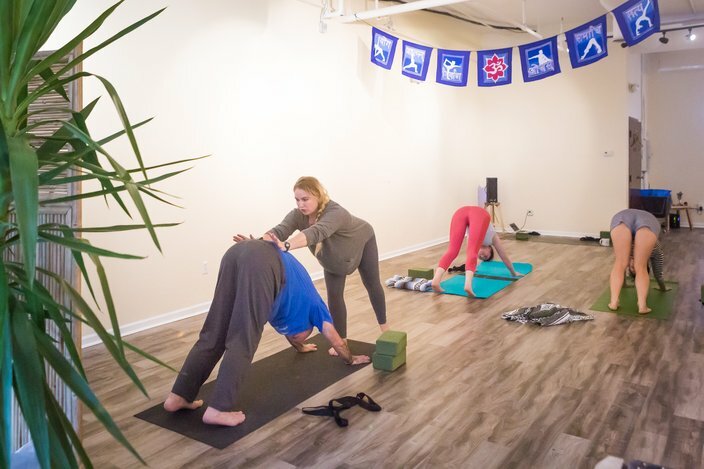 With ample class offerings and times, you’re bound to find a class for you — at this quaint East Falls studio — that will undoubtedly help you grow your practice, thanks to their blended outlook on yoga. Yoga Brain is at 3426 Conrad St. in East Falls. Drop-ins run $15 a pop.